The main street in Five Cays, Providenciales. 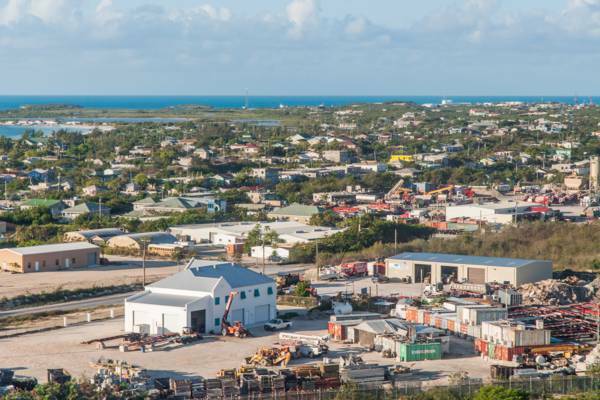 Aerial view of Five Cays, Providenciales. One of the three original settlements on the Providenciales, Five Cays is found on the south coast of the island. Beginning as a fishing village, this residential area is home to several small shops and restaurants. Along with Blue Hills and The Bight, Five Cays was one of the first settlements on Providenciales. After the decline of the cotton and sisal plantations in the early 1800s, the small populations that remained on Providenciales turned to the small scale fishing and ship salvaging (wrecking) industries for economic support and these three settlements naturally formed due to their coastal locations. The main tourism attraction in the area is Bugaloo’s Restaurant, an establishment specializing in local dishes and freshly-caught conch. Several churches are found in Five Cays, including the Paradise Baptist Church, as well as the Enid Capron Primary School. This region was named after the small limestone islands that are found off the coast of the old fishing village site. There are more than five cays in the area, but the mini-archipelago that inspired the region’s name consists of Middle Cay, Bay Cay, Sim Cay, Pusey Cay, and William Dean Cay.